April 20th the American dining experience is redefined with the opening of this home town restaurant and tavern. Kettle Hill is the brainchild of Keystone Hospitality partners, Desmond Reilly and Kristopher Carr. Their partnership with Oriole hero, Rick Dempsey makes Baltimore a natural fit to launch Kettle Hill. The namesake harkens back to one of the purest American legends in one Teddy Roosevelt, and his all-volunteer cavalry know as the Rough Riders. His band of athletes and cowboys fought and won their famous battle for Kettle Hill in the Spanish – American War of 1898. His bold and creative ethos permeates every facet of the concept. Our American Kitchen and Tavern will be a smartly casual, fun and approachable restaurant with innovative and creative flavors. April 20th the American dining experience is redefined with the opening of this home town Restaurant and Tavern. The acclaimed Restaurant Row, at Power Plant Live! will host the first location of this exciting new brand. Kettle Hill is the brainchild of Keystone Hospitality partners, Desmond Reilly and Kristopher Carr. Their partnership with Oriole hero, Rick Dempsey makes Baltimore a natural fit to launch Kettle Hill. The namesake harkens back to one of the purest American legends in one Teddy Roosevelt, and his all-volunteer cavalry know as the Rough Riders. His band of athletes and cowboys fought and won their famous battle for Kettle Hill in the Spanish – American War of 1898. His bold and creative ethos permeates every facet of the concept. Baltimore native, and prolific interior designer Brian Swanson will bring a new and exciting look to the space. Both beautiful and rugged with reclaimed woods, distressed leather in a comfortable natural setting. Swanson has worked in the U.S., Canada, South Africa and the U.K., and after finishing a stellar project with Steve Wynn, and his Wynn Encore, in Las Vegas, he has come home to help bring this incredible concept to fruition. Brian brings many years of international experience and expertise to Kettle Hill and his greatest strength is his ability to envision exciting, unique and functional spaces. His numerous and diverse projects illustrate a passion for design and planning that gives his work a singular, always thought-provoking aesthetic. Reilly and Carr, the principals behind the project, describe it best. “Our American Kitchen and Tavern will be a smartly casual, fun and approachable restaurant with innovative and creative flavors. The menu of regional American grill fare will be served with a keen sense of seasonal freshness. Robust, local ingredients will enjoy simple but aesthetically bold and expressive preparation. The focus will be on delicious food, in an entertaining environment at a moderate price.” We are extremely excited to have Chef Sarah Acconcia on board to make this happen. Ah-CON-see-ah, remember the name. The acclaimed Executive Chef honed her craft in some of the city’s most eclectic and exciting restaurants. The 26-year-old comes to Kettle Hill through the kitchens of both 13.5% and the amazing Woodberry Kitchen where she honed her craft on the wood oven, and fed her growing interest—and respect—for our food’s origins. Championing a diverse background in all aspects of her work, this young starlet is as impressive at the grill as she is with pastry. Having received a bounty of awards and hosting successful stages at both Tru and Alinea in Chicago, in addition to New York City’s famed Room4Dessert. Sarah has taken her traveled and tested view of the world, and how we can dine from it to the next level at Kettle Hill. Born in New York City as the child of a Foreign Service Officer, Sarah has lived in Bucharest, Romania; Hamburg, Germany and England, before the family finally settled in northern Virginia. Sarah during her time at MICA (Maryland Institute College of Art) fell in love with Baltimore and has made it her home. Every great tavern must have an incredible bar, and the aptly named “Saddle Bar” and its dynamic rotating menu of handcrafted cocktails will be served alongside local draft brews. 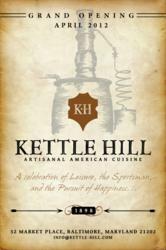 Kettle Hill will also offer a comprehensive and affordable wine list. The ever-present attention to detail remains with its Kold draft ice program, focus on seasonal ingredients and comfortable entertainment driven setting. “Teddy Roosevelt was a huge advocate of sports, and we openly embrace sporting events but will not be defined by them. We offer an alternative viewing venue to that of the stereotypical experience. Kettle Hill will present the big game in a setting unlike any other in the area while delivering a meal to rival the finest kitchens in the nation.